SuperCharger sets priority of active window to "High" and set other processes to "Normal" priority. 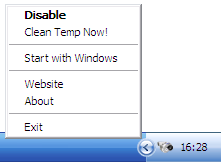 This speeds up active window process. That means your active program is always SuperCharged! In addition, SuperCharger will clean temporary files folder by "Clean Temp Now!" menu option. 【下篇】K-Meleon 快速、輕巧、不拖泥帶水! 最快速的 Gecko 瀏覽器!